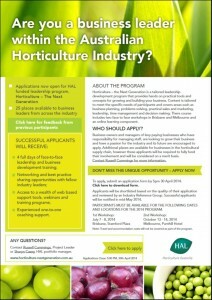 Are you a business leader within the Australian Horticulture Industry? If so then you should consider applying to be a part of the HAL funded business program “Horticulture – The Next Generation”. The program is in its third year and is limited to 25 business leaders from across the Australian Horticulture Industries. A number of our industry members have taken part in the past two years and have gained some invaluable business and management tools.